This story was quick and easy to read, but it had a huge emotional impact. Before I read this story, I didn’t know much about the effects of the Vietnam war, though I’d heard of “boat people”. 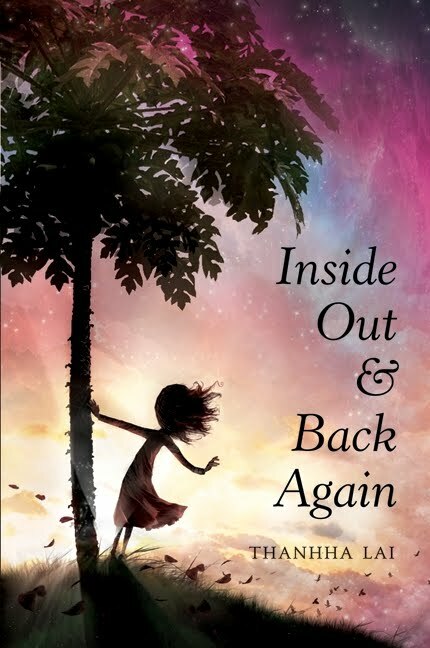 Although this is fiction, the author did move to Alabama at the end of the war, so her real life experiences allowed her to include many details and images to make this story of a ten-year-old girl come alive. I don’t usually choose novels in verse (though I’m warming up to them) but I think it was an effective way to tell this story. I liked Ha’s character and personality, I wanted to see her succeed and overcome the many obstacles in her life. As a writer, I admired the way the author could use so few words to create compelling emotion and imagery. I recently looked at the list of recent Newbery Medal andHonor books and decided I should read more of them, so I got this one at the library. Thanhha Lai lives in New York and worked as a journalist for a short time before deciding to concentrate on writing fiction. She was born in Vietnam in 1965—the year of the snake. For more about the author, visit Thanhha Lai's author page at Harper Collins. One of the best things about summer is taking time to just read and enjoy a good book. Today I read the YA novel, Pregnant Pause by Han Nolan. This one is definitely not for a MG audience. I read it practically all the way through, because I liked this original take on what could have been just another teen pregnancy story. Han Nolan doesn't sugar coat the issues and the characters talk and think about them in a realistic way. I loved how the main character learned about herself through her different relationships with her boyfriend, family, friends and enemies. I heard so many good things about this book I was excited to finally borrow a copy from my local library. But it’s so amazing that I’m putting it on my list of books to buy! Auggie’s facial anomaly is a reality that can’t be ignored, but at the same time he’s just an ordinary boy—with a sister, an aging dog, friend problems and a StarWars obsession. This novel is full of funny moments, as well as touching and heart-breaking ones. I was so wrapped up in Auggie’s story that I was surprised when the author started to tell the story from the point of view of his sister…and then some of the other kids. But it was a really cool way to tell the story and show different sides of Auggie’s character. As a writer, I am so impressed by the way the author got inside the mind of a 10-year-old boy and showed the world from his perspective. I’d read this again to study how she used dialogue and details to create an authentic view of the grade 5 experience. I also liked the chapter headings and I noticed their significance more after I’d read the entire novel. R.J. Palacio lives in New York and worked as an art director and book designer for many years. 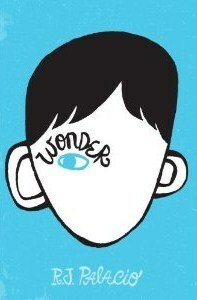 This is R.J. Palacio’s first novel. 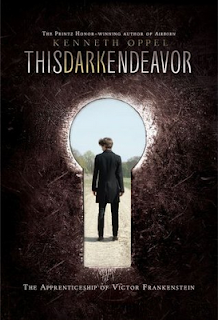 It’s worth visiting the Annotations page on the author’s blog to read about why she included the specific quotes and songs, and tidbits about creating the characters. For more, visit R.J. Palacio’s website. Earlier this week, author P.C. Wrede posted on the real difference between "showing" and "telling" and what it means for a story in her post Show vs. Tell. She has nicely put into words what I've always thought about the whole issue of "showing" (or dramatizing events) vs. "telling" or (stating something without actions or thoughts to back it up). Making it a never-to-be-broken rule to show instead of tell isn't always what's best for the story. Like anything else, these are different techniques available in your writing toolbox and both can work, depending on what is needed. The key is to think about the context of each line in the story (and that's why revisions seem to take forever). Cheering for a writing buddy who got some great news. This week, my writing buddy Debbie Ridpath Ohi (Inkygirl) found out that her debut book as an illustrator, I'm Bored by Michael Ian Black, got a starred review from Publisher's Weekly!!!! Yay!!! To read more about it, check out Debbie's post. Also this week, I came across an amazing video by Denise Jaden, author of Never Enough. She asked some writers talk about how they felt during their high school years. I connected with it right away, and it made me wish all teens could watch it and think about what makes them special or what they are good at, despite what anyone else has to say. As I revise my novel, one of the things I'm noticing is that I'm often amplifying character reactions and behaviour beyond what they'd be in ordinary life. It's not that I'm trying to create an extraordinary character. (Though I suppose all authors want to think of their characters that way on some level, or else why would we bother writing about them?) But using words to shape personality involves making judgments about what is important for the reader to know, see or feel and then writing to emphasize those elements. To bring out a character's personality, I think it's important to sometimes make their reactions a little over-the top. Give them a dramatic flair. In the same way that writers pile on more and more impossible obstacles for a character to struggle through, the actions and reactions of the character need to be big and bold to show that they are up to the challenge. Being bold doesn't mean that characters can't be quaking in their boots or feeling timid in the face of danger, but their fears or lack of confidence need to be big enough, noticeable enough, for it to stand out to the reader. 1. Create a character that is conflicted to begin with. If there is something about the character that sets up an inner conflict, it can create empathy even before the story gets started. A typical example in a middle grade or YA novel might be having a character with a parent that recently died or moved out. Or some type of disability. Even if that's not what the story is going to be about, there are underlying emotional issues to resolve and that creates more drama. 2. Have secondary or minor characters react to what the main character is doing. This draws attention to the reaction or behaviour for the reader. If the other characters think it's important, then it must be important. 3. Choose the reaction with the most impact and let it stand on its own. Write all about how the character acts, thinks and feels when reacting to an event in the story. But then go back and choose the most compelling way to describe it and cut the rest. Over-explanations take away from the dramatic impact. But watch out for the opposite problem too, where the reader doesn't know enough about what the character is thinking and feeling to care. It's all about balance. How do you make your characters more dramatic? I love reading about tiny creatures and their different perspective on our world, so I really enjoyed this story. It reminded me of one of my old favourites “The Cricket in Times Square” by George Seldon, because of the writing style and the sense of adventure. The idea of a beetle that draws and helps to solve the mystery of a famous stolen Durer drawing was fascinating. I’d love to draw as well as Marvin the beetle! As a writer, I admired the way Elise Broach created a close relationship between the boy James and the beetle Marvin, especially when Marvin couldn’t communicate by talking. Elise Broach lives in Connecticut but her favourite cities are New York and Paris. 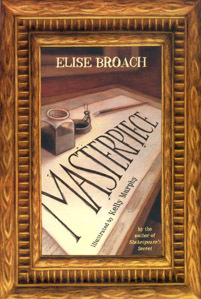 Masterpiece has been recognized with the E.B. White Read Aloud Award by the Association of Booksellers for Children in 2009 and as an ALA Notable Book, as well as named the Best Children's Book of 2008 by Publisher's Weekly . For more, visit Elise Broach’s website. Since I'm not working at my day job for a couple of months, it's tempting to spend more time than I usually do on writing. I can sit in front of my computer for hours perfecting a paragraph because I have the time. Except I don't know how much that really helps my writing. It's more like an obsession. Three times yesterday I had to grab my notebook when I wasn't writing, once because I had an idea that linked up with a story I'd started a while back, and two other times because I had ideas for the novel I'm revising and what I need for the next scene. I'm not sure I'd have gotten those ideas if I was still sitting at my desk, concentrating on perfecting every word. I love learning new things, but they can't all be about writing. It's interesting how, when I'm learning about something like cooking or gardening, it opens up my mind to new ideas and that often gives my writing a boost. So this summer, I'm going to make sure I take time for some of the other things I like to do -- playing board games, working on my gardening, trying out recipes (this week I made raspberry-rhubarb pie), or going on nature walks to explore places I haven't been. I do think it helps to keep the creativity flowing if I do some writing every day. But for me, it's also important to remember to get away from my desk and do some living. Do you ever have to drag yourself away from your writing? What are you going to do for yourself this summer that doesn't involve writing? For eleven-year-old Gopal and his family, life in their rural Indian village is over: We stay, we starve, his baba has warned. So they must flee to the big city of Mumbai in hopes of finding work and a brighter future. Gopal is eager to help support his struggling family, so when a stranger approaches him with the promise of a factory job, he jumps at the offer. But there is no factory, just a small, stuffy sweatshop, where he and five other boys are forced to make beaded frames for no money and little food. The boys are forbidden to talk or even to call one another by their real names. Locked away in a rundown building, Gopal despairs of ever seeing his family again. But late one night, when Gopal decides to share kahanis, or stories, he realizes that storytelling might be the boys' key to survival. If he can make them feel more like brothers than enemies, their lives will be more bearable in the shop—and they might even find a way to escape. 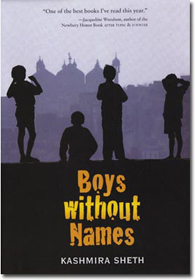 I couldn’t put this book down because I had to find out what happen to Gopal and the other boys. Although some reviewers have described this book as slow-paced, I was fascinated by all the details of Gopal’s life in India and I felt they really made the story come alive. It was hard to read this story, because I grew so emotionally attached to Gopal and was angry about how he and the other boys were treated. I enjoyed reading the author’s notes about the research she did about child labour. This novel opens up many opportunities for discussion about fairness, child labour, peer groups and the power of community and sharing personal stories. As a writer, I admired the way this author was so careful to show the story from Gopal’s perspective, using dialogue and thoughts that stayed true to the main character. How I discovered this book: I spotted it on the shelf of a library branch I don’t often visit. I’m glad I found this author, because now I’ll look for her other books! Kashmira Sheth was born in Bhavangar, India and moved to the U.S. at attend college when she was 17. Before she became a writer, she worked as food microbiologist testing milk, cheese, ice cream and other food products for bacterial counts and pathogens. She has also run a dance school. For more, visit Kashmira Sheth’s website.